Lots of people contact me asking to license my fonts for different purposes. I was more that happy to donate the usage of the heart icon to my new friend Chris. She was searching for the perfect image that she felt depicted her new endeavor. And this project just seemed so right to me. Chris is a cancer survivor. And she has found that there are very few Hallmark cards that are just right in this situation so she has created this line of cards. 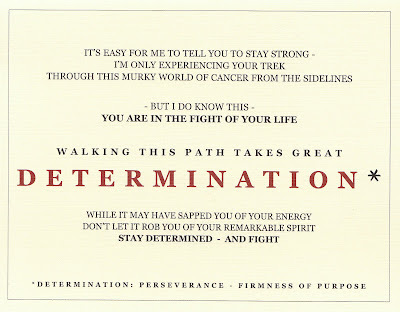 This is the front and back of one of the cards in the "An Encouraging Word" series. She has 3 sets of cards and each set has 6 cards in them. Insides are blank so you can add your own message. The other series are "Real People - Real Voices" to provide encouragement and support to the caregiver. And "Psalms - songs of strength" to coincide with the recipient's treatment regimen. 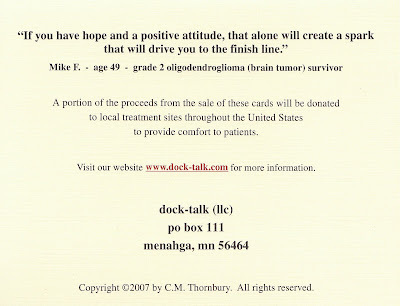 A portion of the proceeds from the sale of the cards goes to various treatment facilities. Their goal in this endeavor is to provide much needed equipment to the centers, as well as supplying items (magazine subscriptions, DVD's, etc.) that will benefit the patients directly by giving them something to pass the time as they undergo treatment. Unfortunately these are cards we all need. I don't think there is anyone who has not been touched by cancer in some way. For more info or to order go to www.dock-talk.com.